When I started learning about using herbs and essential oils for health, becoming an actual herbalist was not in my mind at all. I really didn't even know what an herbalist was, or what one did. The suffix, "-ist" means "one who does," so being an herbalist essentially means, "one who does herbs." Of course there is a LOT more to being an herbalist than that, and there are many levels of herbalism. But I had this little voice in my head and heart telling me to go learn about the plants for my health. Go to that "weird herb store" and see what it's all about. Try those strange "oils". But when I started searching for information about herbalism and all it entailed, there was very little out there to help me get started. I am writing this to give you some starting points, if that thought, "I'd sure like to know more about natural health and using herbs for myself and family," has ever flitted through your mind and heart. The bottom line is, if you are a person who wants to be more in charge of your health, less dependent on chemical drugs made by big pharmaceutical companies, and able to adjust your lifestyle for optimal health and joy, then herbalism (and becoming an herbalist) is probably right up your alley. I've been studying and using herbs for a long time: not as long as some, and much longer than others. I can say I have actively been reading, using, experimenting, creating, and now am comfortable with my family's herbal choices in lieu of conventional medications. In fact, I am far more comfortable using herbs for healing ourselves than I am with any pharmaceutical or over-the-counter drug. In my personal experience, herbs work better and apply to your overall health and well-being. Do you want to learn more about becoming a family, community, or clinical herbalist? Would you like to teach about it? Write about using herbs? Share your successes with the plant world? Here are some things to do right now if you are answering "yes" to any of these questions. FTC Disclosure: Some of the links scattered throughout this article are affiliate links. If you click through and make any kind of purchase, I may earn a small commission at no extra cost to you. There are things everyone and anyone can do right now to further your knowledge, comfort level, and confidence in using herbs for your health and even emotional happiness. Here are some basic steps to take that are simple and will get you going! 1) Why do you want to become an herbalist? Decide your personal "Why." This "why" is pretty individual, and differs for every person. Some people want to help others, other people just want to be more aware, others are interested in emergency preparedness and survivalism in case SHTF, and others want to take charge of their own health instead of turning important decisions over to doctors who are too busy and stressed to care. When I decided I wanted to become an herbalist, I was already well on my way to learning and using herbs for my family and friends. I started out with Rosemary Gladstar's book, Medicinal Herbs: A Beginner's Guide (which I still refer to today). I have to say this is the BEST book for beginners, as well as very helpful for intermediate and even advanced herbalists. I started trying out her suggestions in the book, creating herbal preparations, and I found they really worked! They worked far better than the OTC drugs I had been taking up to that point to alleviate menstrual symptoms, sleeping issues, emotional problems, minor pain and headaches, and more. I got so excited! I started sharing with my friends at work and my extended family. Most of them thought I was crazed. Oh well. I KNEW at that point that using God's natural plant medicine was the way to go. Anyhow, my "why" has evolved from just taking care of my own personal health issues to wanting to teach and share with others just how wonderful this skillset is to have. And that's why I have so many herbal articles on my blog. So---determine your own "why" now. It's likely to change over time, and that's perfectly fine. In fact, it's better than fine: It's AWESOME! This is related a bit to comments I made above, and you can once again reference Rosemary Gladstar's exceptional book on Amazon (which I totally recommend). But learn! Read, watch, try. There is so much free information on the internet. Now---the internet can't always be trusted. So my rule of thumb if I'm doing research online is to cross-check against at least three different articles if I can and try to choose from reputable sources. There are many more, and I know I'm forgetting some that should be here, and I'll add them as I think of them. The usual sites people go to, like Dr. Axe, WebMD, and Dr. Mercola are just fine, but they are often written by guest writers. Just be sure to do your double- and triple-checking! 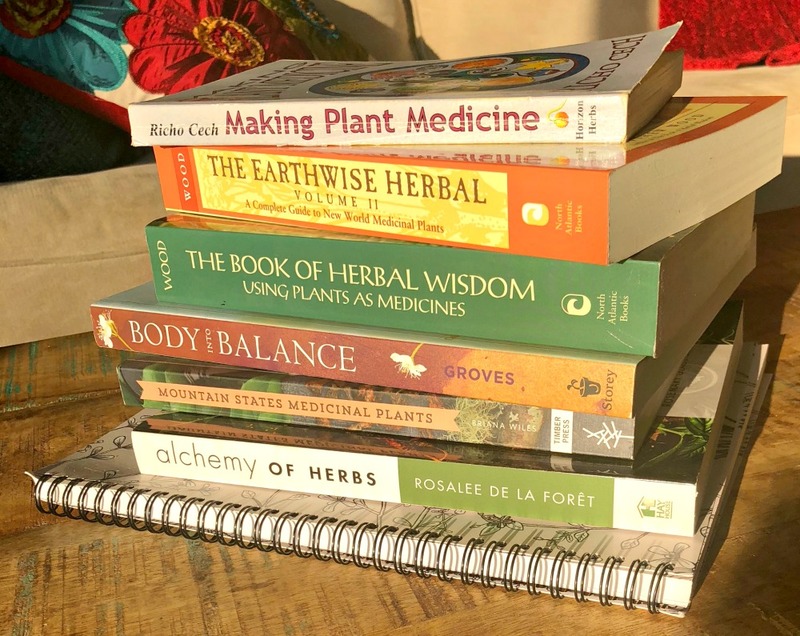 There are more books, too---and more are coming out every day, since herbalism is becoming more mainstream, thank goodness! I love all the ways I mentioned above, but I love taking classes too. I admit to being kind of a class "junkie," and sometimes I don't even finish, I enroll in too many at a time. But still, taking courses online is the BEST thing I've done except for the actual experimenting and hands-on work. My first course was Rosemary Gladstar's (can you tell I'm a fan?) course The Art & Science of Herbalism. I am not an affiliate for them, but I can tell you that this course was one of the best things I ever did in my journey in learning about using herbs for health. Then I moved on to The Herbal Academy of New England. I am an affiliate for them, but I can honestly say they have a very broad, diverse group of classes, there is something there for everyone at any level. Even if I were not an affiliate, I still would recommend them. Guess what? The Herbal Academy of NE is offering a FREE Becoming an Herbalist course online for a short time. Registration is through August 5! This might be a great way for you to start your journey! And here are some more! Those jars in the background? They are herbal infused oils processing away for me to use in herbal salves, soaps, and body care---and maybe even a salad dressing! 3) Start small, but START! Start with easy things first. How about learning how to make herbal teas? You can find out the basics in my Creating and Preparing Herbal Teas for Pleasure & Health eBook, if you like. You'll also find tons of recipes for herbal tea blends online and in your courses. Herbal salves are wonderful to start out with too! Plus, you can get creative with them by using essential oils, too. I actually began with tinctures, in my herbal journey. This is because (I'm being honest here), drinking herbal tea was really not my thing. I have a different opinion now, of course, but still---tinctures remain my favorite of all the herbal preparations. They are quick to use, easy to make, and they are beautiful while they are processing on your windowsill. How to Make an Herbal Tincture, and What is a Tincture, Anyway? There are lots more herbal tincture, tea, and salve recipes on the blog! Anyhow---once you try some herbal recipes, you'll be convinced! And excited! And your journey will have begun! Think about your personal health needs. Do you need to look into using herbs to help your heart? Or maybe deal with pesky cold sores? Or how about topical pain relief? Or maybe it's to help you get a good night's sleep? Perhaps you'd like an easy homemade decongestant or natural cough syrup? Would you like to be ready for cold & flu season? Try making some of the remedies above and see how they do for you. It's by trying, testing them, adjusting them to be the way YOU like them to be that you will learn what works for you and your family. Being an herbalist is a little like being a scientist. And an artist. It's a creative study. But try easy remedies and grow from there! Start small. Start with common herbs and easy to make preparations. There are certain herbs you will find yourself turning to again and again. Like Lavender. Or Calendula. Or Mullein. I could list many herbs here that I keep on hand and fresh at all times. Hmm....This topic deserves an article of its own. At any rate, you will start building and adding, and before you know it, you'll have a little pharmacy in your own home! Cool, right? There are quite a few places to buy quality herbs. Starwest Botanicals, Mountain Rose, Frontier Co-op, Bulk Apothecary and many more. My favorites in this list are Starwest and Mountain Rose, in that order. Their prices are similar, the quality is great from both of them. But I have found Starwest Botanicals' shipping and customer service to be excellent. Mountain Rose has a pretty good blog for information. But try a few different online companies. You can also purchase from Amazon. Many herbalists like myself love to forage for wild plant medicines, like this lichen with antibiotic properties, Usnea. 6) Keep a journal (or journals). I started out with one journal, then it got filled up. And everything was unorganized. Now I have about five fairly filled up journals. Because I have learned it's a REALLY good idea to keep track of your recipes. It's easy to think, "Oh, I'll remember how to make this." Then, when you need the particular preparation, you don't have it if you haven't written it down in a place you can find it. 7) Learn and do some more. Learning to use herbs for your health is a journey. It takes time. Lots of time. I have people say to me all the time, "How do you know so much about herbs? I wish I knew how to do this or that." My friend, we all start somewhere. And it is NEVER too late. I'm in my mid-fifties now, and I was about 42 when I began my own journey. I wish I had started much, much sooner. I have spent a ton of time and fun efforts on learning these herbal skills. And I will never be done with learning. Never. It's ongoing. Forever. And I'm glad about that. 8) Have fun learning to use herbs, and don't give up. If you don't find joy in the process, then you won't continue. It's as simple as that. You need to be motivated to learn to be an herbalist. Perhaps after dabbling a bit, you might find that going full-on like I did isn't your thing. That's ok. That's why there are people like me and other herbalists in this world who are glad to help you and share remedies--often for free. 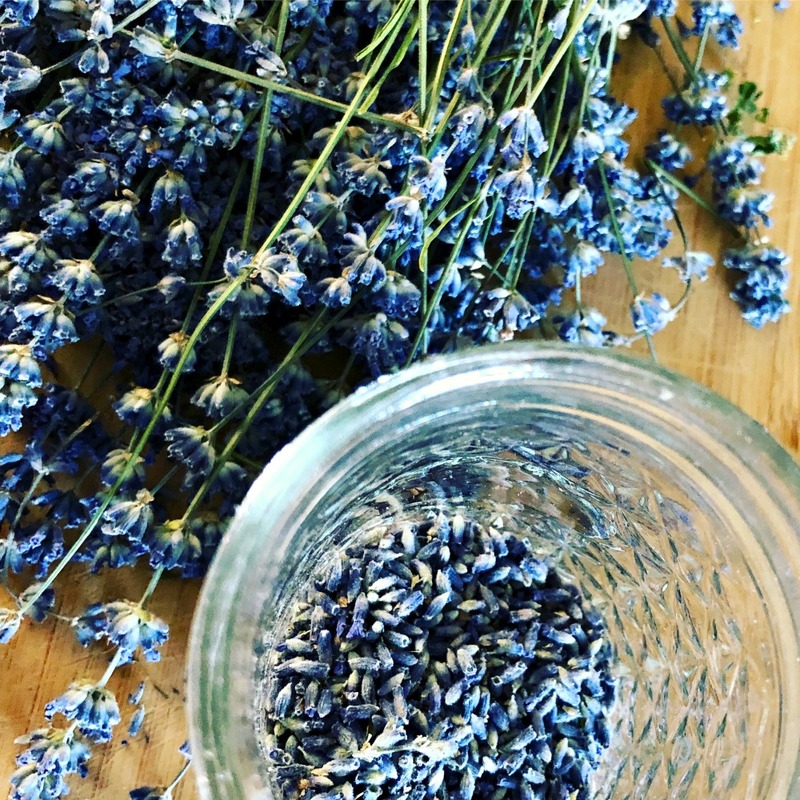 But if you are reading this article, it is my bet you will LOVE learning about herbs and making plant medicines for yourself. It's a beautiful scientific and creative process that is different for every single person. Some herbalists love to grow their own herbs, like this lavender I picked from my garden. But no worries if you can't forage or grow your own! You can purchase wonderful herbs from suppliers like Starwest Botanicals. These are all great ideas. But an idea is just that: An idea. UNLESS you take some action! Get out there, read, study, do, experiment, forage in your area, immerse yourself in learning all about using herbs and plants for your health! I am SO glad I pursued that little voice inside me that kept saying, "Go natural. There's a better way for you. Go for the plants!" It was a little whisper that became a roar. And I listened, and I am so glad I did. Maybe you have that little whisper too? Good luck in your own personal herbal journey, my friend! P.S. Sign up for our newsletter if you haven't done so yet! You'll never miss a thing AND you’ll get access to the password protected Resource Library! It contains eBooks, guides, checklists and lots more, including the eBook, How to Relax Using Herbs. Enjoy! P.P.S. I ALMOST FORGOT!!! The Herbal Academy of New England is offering a FREE course on Becoming an Herbalist. Registration closes August 5, and I'm not sure if they will offer it again. What a great opportunity to see if herbalism is for you---FREE! 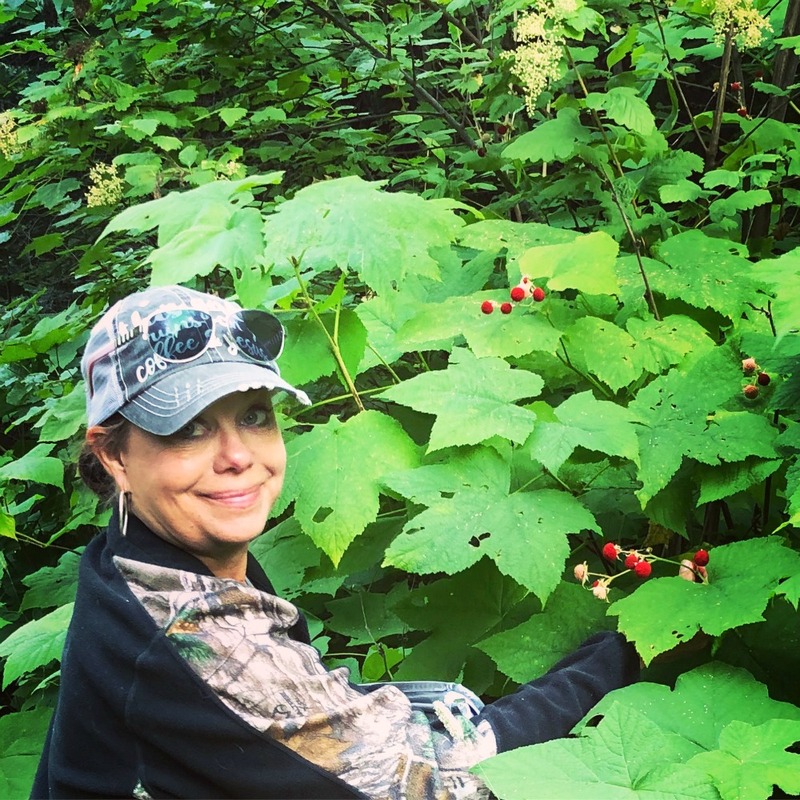 On this day, I was out foraging for Thimbleberry, St. John's Wort, Usnea, Yarrow, and wild Daisies. Here is my binder of lessons I got from taking Rosemary Gladstar's course. It was one of the best things I've ever done in my life. Once you have knowledge, you own it. You have invested in yourself. It's yours. And it will serve you! Disclaimer: I am not a medical doctor. In no manner, stated or implied is any wording here or in anything I share, state, or write, meant to treat, cure, prevent, diagnose any illness or disease. Please seek medical attention if you have concerns or worries about health issues. Full Disclaimers and Disclosures Here.